Hello! Welcome to the internet home of YA author Mindee Arnett. That’s me! I write Young Adult Fantasy, Science Fiction, and Horror. I’m the author of the The Arkwell Academy Series, a contemporary fantasy, the sci-fi thriller Avalon, and my upcoming high fantasy Onyx & Ivory. Be sure to follow the links to my twitter, Facebook, tumblr, or my newsletter sign up. I love chatting with readers. I’m one of those authors who doesn’t have a google alert on myself or my books. I don’t visit review sites. Mostly, because I believe those places are for readers, not authors. That said, if you want to make sure I know what you think about my work (especially if, you know, you like it) feel free to drop me a line at mindeearnett@gmail.com or visit some of my other social media places. Some of the biggest influences on my writing are J.K. Rowling, Maggie Stiefvater, Stephen King, Roald Dahl, C.S. Lewis, Joss Whedon, and Jennifer Roberson. 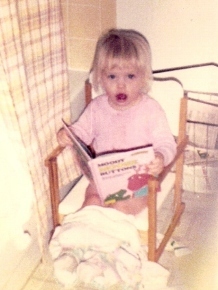 My love for reading started at an early age. Very early. I wrote 4 novels before signing with Suzie and selling The Nightmare Affair. I only submitted 1 of those novels and received dozens of rejections letters. Moral of the story: Keep writing, keep trying. My best friend in the whole world is my big sister, Amanda. One of her hobbies is painting horse portraits like the one below. I have a BA and MA in English Literature from Wright State University in Dayton, Ohio. I believe in ghosts, aliens, angels, demons, God…and the Winchester Brothers. Whedonite, Whovian, and lover of all things Veronica Mars. Gamer. My current obsession is Destiny (XBox One). I once was in training to be an amatuer boxer until I broke my nose sparring. Twice. Yeouch. My license plate holder reads: Leaf on the Wind, Wash is my Co-Pilot (and if you know what this means, you and I can definitely be friends. Apparently, I’m the world’s most comfortable animal sofa. In high school, I sometimes did Civil War Reenacting, which might make me the biggest geek ever. But, come on, hoop skirts, ballroom dancing? What’s not to love about that? If you’d like to cyber stalk me, check out my contact page.